Couples and families who want to relax near Arenal volcano but don’t want to go over budget. Relaxing at a hotel with its own hot springs is a great way to spend your vacation. Paradise Hot Springs features seven naturally heated pools. It is truly an oasis of tranquility and lush gardens. 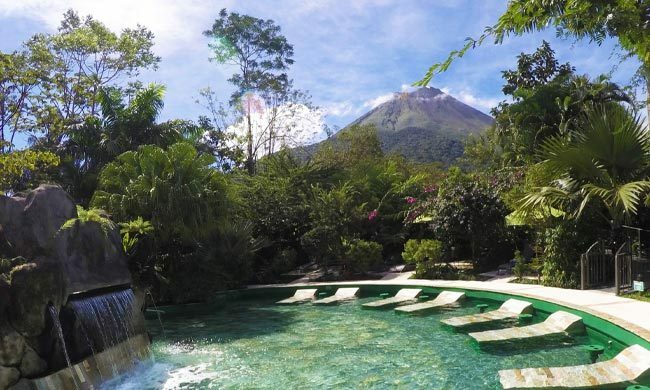 Enjoy a boutique hotel with nearby adventure tours and views of the famous Arenal Volcano. On-site hot springs. There are 7 pools of natural mineral water. Boutique feel. Few rooms mean more privacy and quiet. Lush gardens, volcano & forest views. Upscale luxury. Your basics are covered, but they have nothing extravagant. Large crowds. The hotel’s hot springs are open to the public, but they limit the number of visitors to avoid overcrowding. Located three miles from La Fortuna downtown, Paradise Hot Springs is a boutique hotel whose biggest attraction is its naturally heated hot springs pools. A hidden spot in the heart of the Arenal area, this hotel provides comfort and quiet with its reduced number of visitors. Rest and enjoy as you please! With only 8 villas or ‘casitas’, this hotel offers an uncrowded space to take in the embracing view. The rooms themselves are unpretentious, modern but cozy. The uncluttered space allows you to stretch and relax after a day of exploring the rainforest in the area. Arenal is called the Adventure Capital of Costa Rica for a reason. There are plenty of opportunities to go out and explore the great outdoors. Take tours to go zip lining, river tubing, horseback riding, or even kayaking in Arenal Volcano’s lake. If you feel more like staying in the hotel, Paradise Hot Springs has got you covered. Lounge in the sun chairs and admire the view of Arenal Volcano, or walk around and enjoy the tropical plants surrounding the pathways across the property. Native species are abundant here, especially palms. Keep your eyes open for flashes of red and yellow from flowers as you go along. Try to catch sight of frogs, birds, and insects as you enjoy the property. When it comes to food, Paradise Hot Springs has options for you as well. The on-site restaurant, Azalia, provides breakfast, lunch, and dinner to guests. It usually offers a buffet style meal where you can have your choice of Costa Rican and international styles. Sometimes there are a la carte options as well, and if you want some variety, the nearby town has many restaurants to try out. There is also a swim-up bar in the largest hot springs pool. Phoenix Bar is the place to regain strength after an afternoon of skipping from one pool to the other. Make sure to try one of their cocktails or fruit smoothies right as the sun sets. The bar also has snacks in case you’re peckish before dinner, and it includes vegetarian options. This hotel’s greatest attractions is its hot springs. The water is naturally heated by the internal motions of the Arenal Volcano, and it’s pumped into the hotel’s seven pools for you to enjoy. Built with different sizes, the pools all have names and varying temperatures depending on what you feel like experiencing. The Jacuzzi is ideal for small groups or couples who want a more private time while relaxing. The largest pool offers in-water seats and the clearest view of the Arenal Volcano. Admire the conal shape and its hardened lava paths from a safe distance, in the warmth of the mineral water. Some of the other pools are also suited with hydrotherapy massage systems. Sit in one of the bursting flows of water to soften the knots in your muscles, or head to the artificial waterfalls to release tension in your back and neck. The hot springs are open to the public, but Paradise Hot Springs understands crowds are not good when peace and quiet are what you’re looking to experience. The hotel limits the number of visitors to avoid this exact problem. If you want a relaxing time in an unpretentious hidden gem, with on-site hot springs and the chance of adventure, Paradise Hot Springs is the perfect place for your Costa Rica Vacation. Simply contact us and we can make your journey to Arenal a reality!